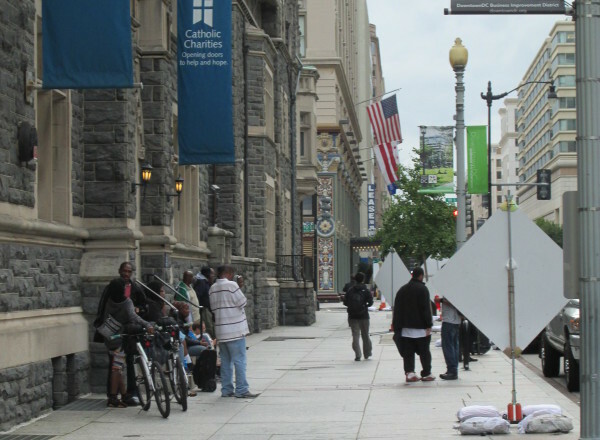 WASHINGTON, Oct 17 2013 (IPS) - Near the Martin Luther King Jr. Library in downtown Washington, just a few blocks away from the federal district, dozens of homeless men and women wait for the evening shuttles that will take them to their dinners at one of many food shelters around the city. They can get by during the day with the few dimes and quarters spared by passersby, but the only daily meal they can really count on is the one they will get at the local food shelter, and so for them, hunger is a very real problem. Two weeks before federal legislation that will cut funding from the Supplemental Nutrition Assistance Program (SNAP), also known as food stamps, goes into effect on Nov. 1, thousands of families around the country wonder how they will put food on the table, while the homeless wonder about meals from shelters, because the one meal they used to count on is no longer a guarantee. "The bill comes at a terrible time, when the needs in this country are tremendous." Last month, the Chairman of the House Agriculture Committee, Frank Lukas (R-OK), introduced new legislation that will cut almost 40 billion dollars from the SNAP programme, the main source of food funding for thousands of struggling families across the country. But while the SNAP cuts may save the U.S. government budget billions, the effects on millions of struggling Americans will be catastrophic, critics say. “The bill comes at a terrible time, when the needs in this country are tremendous,” Josh Protas, the director of government affairs at Mazon, a Jewish advocacy group that fights hunger in the United States, told IPS. He said the cuts will have a devastating effect on people struggling economically and on food banks and shelters across the country. “The new cuts will not be able to compensate for the high demand at food banks and shelters, which are already incredibly stretched,” he said. Bread for the World, a Christian advocacy group, has been pushing Congress to protect the SNAP programme since the new cuts were introduced last September. Feeding America, one of the largest hunger-relief organisations in the country, noted in a recent report that up to 75 percent of SNAP households include a child or an elderly or disabled person, all of whom will be affected by the cuts. Mr. Valentine, 52, is a U.S. Marine Corps veteran who served for eight years. He is now homeless and unemployed, and he told IPS that he relies on food stamps for all his meals. When asked about the upcoming cuts, he expressed desperation and much frustration. “These cuts, this is not right,” he told IPS. “I don’t know what I’m going to do if they take this money away from me. I have a wife and an 11-year old daughter. We live off food stamps.” He cannot hide his exasperation as he awaits the daily 6:15 pm van that will bring him and others like him to Adam’s Place Emergency Shelter in northeast Washington for a hot meal. The SNAP cuts come at a critical juncture, as federal employees are still trying to recover from a government shutdown that left them without income for over two weeks. In fact, those federal workers with lower incomes have turned to community shelters to get food on their tables. The Central Union Mission is one of several non-profit organisations that provide food for people who do not receive food stamps. Located in the Chinatown district, the Mission runs a Food Place Centre in northeast Washington, where volunteers give away up to 125 food bags per day. As the cuts go into effect, organisations like the Central Union Mission will face considerable increase in demand as people turn to organisations that will feed them without stamps. The SNAP cuts are part of the larger Farm Bill that was approved by a small majority in the House last month. The new bill is likely to penalise millions of unemployed Americans who cannot find work and who will be immediately removed from the SNAP programme. “Rather than help unemployed workers who have been hit hardest by the recent economic downturn, this bill would penalise many of those who can’t find jobs by throwing them off SNAP,” Bread for the World and Mazon said in a joint statement with other hunger-relief organisations. I’m a severely disabled cold war veteran. I receive 0 in food assistance. Are you telling me that all those 78 million people on food stamps, not to mention all the other programs, are more deserving than myself and people like me? Is it because I’m a white male? If not, then why? This is sad!! Sad because once again the poor is affected negatively with this cut. Sad because as we watched in disbelief our government–for the people by the people– shut down due in part by those who have an abundance, and use their power to force our President to do as they deem necessary and/or right. Why is it that they–the so-called government–can fail at doing what the “people” sent them there to do, yet their monthly checks continue to flood their bank account? Because of inflated egos and pride, America lost billions; however, our government has chosen to cut those in desperate need of food stamps. Why not cut all of our Congressmen’s checks for the length of the time it took to bring this situation to a resolution–and I don’t mean cut their checks for the sixteen days of the government being shut down. During this period( 16 days) there should additional monetary penalties. Congress had over a year to deal with the issues that cause the shut down. Therefore, from that time, their pay should go into a fund that can be use to feed the homeless and/or elderly. All of the Congressmen’s salaries coupled with the double time penalty during the sixteen days would add up to the homeless being fed and food stamps continuing to help the needy. Perhaps this measure would cause the Congressmen to work together, deal and solve issues, eliminated bipartisanship and using “green eggs and ham” as a weapon to get what their “party” wants and/or it would definitely put a stop to those who go into politics to do what we currently and consistently witness–why? You don’t get a salary or a pay check for doing nothing!!! On the other hand, it’s much like some of the people who receive food stamps–they do nothing and get food stamps to eat, likewise, our Congress do nothing and receive a healthy check so that they can continue to eat at 5 star restaurants…only in America!!! I am all for this cut!! I have watched many people paying with food stamps and have yet to see one person actually use them to buy the staples that will give more bang for the buck! !They invariably buy top cuts of meat,most expensive sea food(have seen them buying lobster)and more TV dinners than You can shake a stick at! They buy better than I can afford and My tax dollars go to support them,many who are in that position because of the choices they make!! When I see the law requiring drug tests and that only good wholesome food be paid for I will maybe change My mind! I have never had any form of welfare in My life because I had only the kids I could afford and was always willing to work!! I was never unemployed for the 55 years of My working life! !